Description: Costzon Eames style chair for kids consists of heavy-duty molded contemporary ABS seat (matte finish), four black coated metal rods, straight wooden dowel legs w/ floor protectors for sensitive flooring. Embedded screws design for the legs give you a elegant appearance. It features durability with large weight capacity of 286 lbs and security with no harmful odor so that your kids can sit on it freely. Give your kids their own furniture and they will be happy to sit! It is an ideal present for your kids' birthday, Christmas! Multiple colors available: Black, Blue, Pink, White. 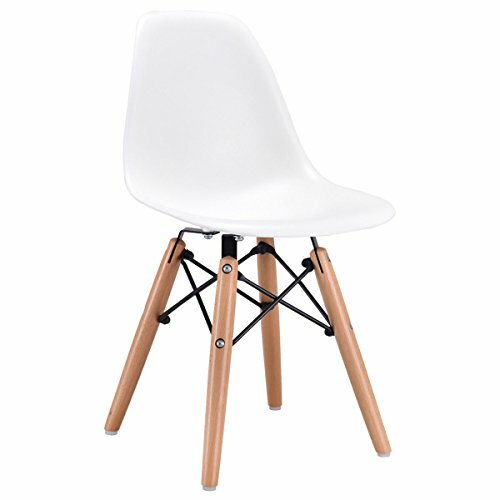 Height From Ground to Seat: 13"
PREMIUM & SAFE - Costzon Eames style chair for kids consists of heavy-duty molded contemporary ABS seat (matte finish), four black coated metal rods, straight wooden dowel legs w/ floor protectors for sensitive flooring. Embedded screws design for the legs give you a elegant appearance. It features durability with large weight capacity of 286 lbs and security with no harmful odor so that your kids can sit on it freely. ERGONOMICALLY SEAT - Ergonomically shaped seat with a single mold plastic made of top-grade ABS material offers extraordinarily comfortable feeling. Great for your kids' living room, dining room, bedroom, nursery, waiting area, parties, banquets, and many more! HASSEL- FREE ASSEMBLY & EFFORTLESS CLEANING - It takes only a few minutes to assemble. Wipe clean with a damp cloth to ABS plastic shells instead of cheaper PP (Polypropylene),don't need to scrub for hours, you could clean it easily. Great Gift - Give your kids their own furniture and they will be happy to sit! It is an ideal present for your kids' birthday, Christmas! Multiple colors available: Black, Blue, Pink, White.